I’ve often felt a little deterred from making confit due to the sheer amount of oil involved – just from an economical perspective, but after recently reading a number of recipes for salmon confit that use an oven instead of a pan and only require the fish to be basted rather than swimming in oil, I decided to give it a go. If you don’t like your fish really rare then this is not for you. If done just right the meat should still look raw but is warmed through via the slow, low temperature cooking method. Mix herbs and eschallots together well. 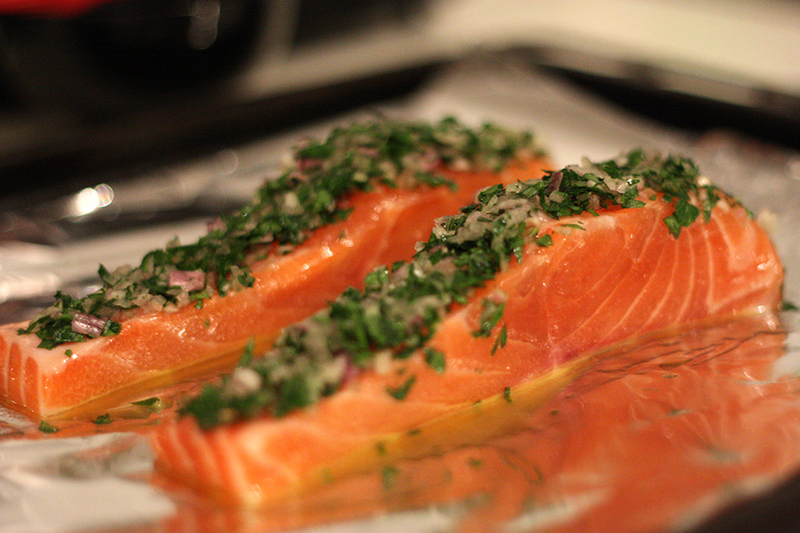 Brush salmon fillets liberally with oil and top with herbs. 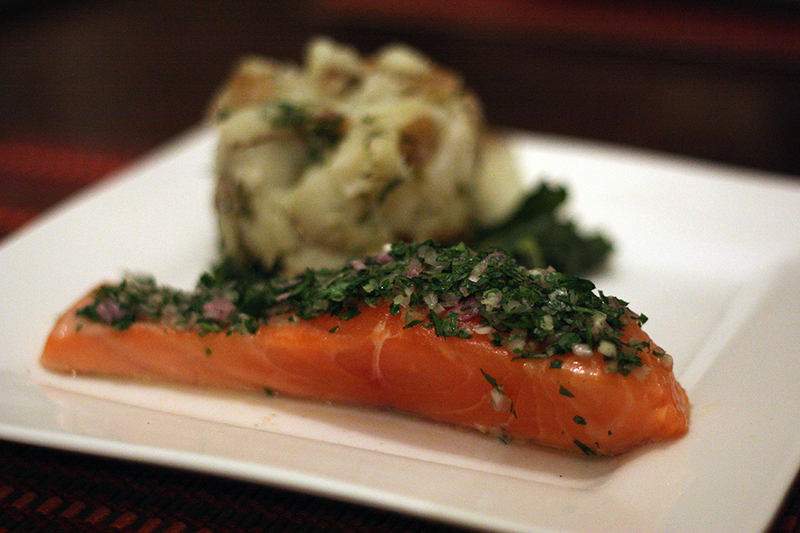 Preheat oven to 150ºC and cook salmon for about 20 minutes. As I said, it will still look raw but it should be warmed through and just done. As an accompaniment I boiled some roughly cubed potatoes (with skin – because I love it), mixed in some finely chopped dill and a drizzle of olive oil then shoved (yes I do mean shoved) the mixture into ramekins and popped these in the oven as well for about 10 mins prior to and during cooking the salmon. The result is they stay warm and have a chance to take the shape of the ramekin. Finally I served the potatoes turned out onto a bed of steamed spinach next to the confit. Voila. Next Post Makin’ bacon, yeah! Gorgeous through & through. Good on you for going with it despite your apprehensions.